Some of the purists wouldn’t look too kindly on the fact that I have flicked the 57 dash for a 55/56 unit but there were a number of reasons behind the decision. To modify a 57 dash for right hand drive properly takes around twenty seven different cuts which equates to a lot of time, effort and money. Without going into all the other reasons I personally prefer the balanced look of the 55/56 dash and Joscar have done it plenty of times so the decision was made easily. To waltz through the door and see the new dash in the car gave me a case of the warm and fuzzies. To get all things aligned and fitted properly there is a lot of mucking around and all the ancillary bits need to be fitted, cajoled, manipulated and massaged so the universe aligns in perfect harmony with all the pieces where they should be. This includes the gauge cluster, dash inserts, interior front window mouldings, speaker grill cover, steering column, ignition switch and other switch gear. Because I can, there will be a few other modifications over the factory offering and once it comes together in surreal alignment it will be welded in place. 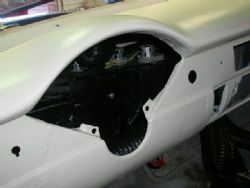 Before you get too carried away with all the dash bits it is a great time to look at what hides underneath and get that sorted as well. When the Nomad left the factory in 1957 it had a wiper motor mounted high in the middle of the firewall on the engine compartment side. 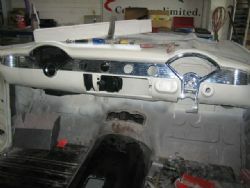 Today you have a choice of where that goes and for a clean look it is now going inside the car, under the dash. A new product on the market, available locally, mounts high to one side and uses a single rod setup to get the water off your windscreen. Air conditioning was an option back in 1957 but my Nomad never had it. When it is reborn it will have climate control. Vintage Air has a range of products to retro fit classic Chevy’s and the upmarket version is an integrated climate control system that is touted to perform like any modern car. The units have multiple options for ducting outlets, compressor types and finishes and feature a compact (sort of) main unit that will also be housed under the dash. By fitting the new wiper motor setup it allows you to mount the unit higher up the inside firewall so very little of it is visible. 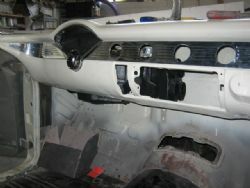 The plan is to have an outlet either side of the dash and fabricate a centre console with two outlets mounted in the middle to blow cool air or heat where it is needed depending on the season. To mount the unit and ducting now before all the gauges, wires and other stuff go in there makes perfect sense. 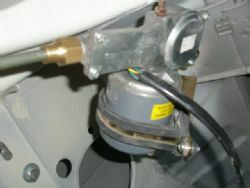 In the photos accompanying this article you can see the wiper motor and the Vintage Air unit mounted behind the dash.